“Hmmmm,” my father said. My mother was eating an apple. 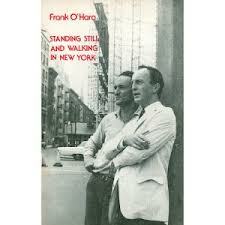 – from “Autobiographical Fragments” in the volume “Standing Still and Walking in New York” by Frank O’Hara. While we don’t remember O’Hara as a pianist/composer, this book of miscellaneous prose pieces by O’Hara does offer essays on Ben Weber and Morton Feldman. I believe that’s Larry Rivers standing to the left of O’Hara in the cover photo above.